Onigiri is the Japanese equivalent of a PB&J sandwich, something to take for a school lunch or on a picnic. One of Eilene’s friends in Japanese class taught her how to do this a couple of years ago. Rice ball is a bit of a misnomer, since you make them into triangles. I had picked up some fresh tofu for dinner and I wanted something more than just plain steamed rice to go with it. This is not an original recipe, but Eilene is the member of the family who makes these. 1. Steam 1½ – 2 cups of rice and then let it cool enough that you may easily handle it. 2. Take a sheet of nori and cut it into quarters. Stack the square of nori and cut them in half once more. This will leave you with eight 2 x 4 inch strips of nori. 3. Set a large bowl of water next to where you are making the rice balls and wet your hands well, so that the rice will not stick to them. 4. Sprinkle a bit of salt on your palms. 6. Having a fillings for your rice ball is completely optional. If you are using a filling, press a hole in the middle of the rice to put the filling into and then press the rice between your palms a second time. Note: Some of the common filling for onigiri in Japan are: pickled plum (umezuke); ½ inch pieces of cooked salmon or tuna; dried bonito flakes (katsuobushi) with a little bit of soy sauce dripped on it; and salmon or smelt eggs (ikura or tobiko). Any salty or savory filling works here. 7. Use your thumbs and index fingers to form the rice into a triangle. 8. Take a strip of nori and fold it over one of the triangles edges. If you have a filling the nori should cover any exposed filling to hold it in. 9. 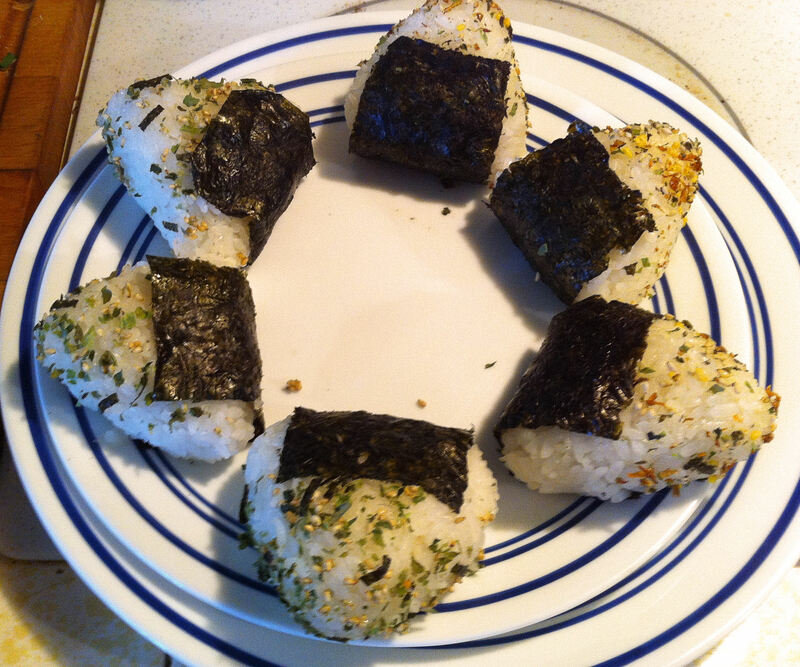 Put a tablespoon of your preferred furikake on a plate and roll the rice that is still exposed in the seasoning. 10. Wet and salt your hands again and repeat steps 5 to 9 until you run out of rice.